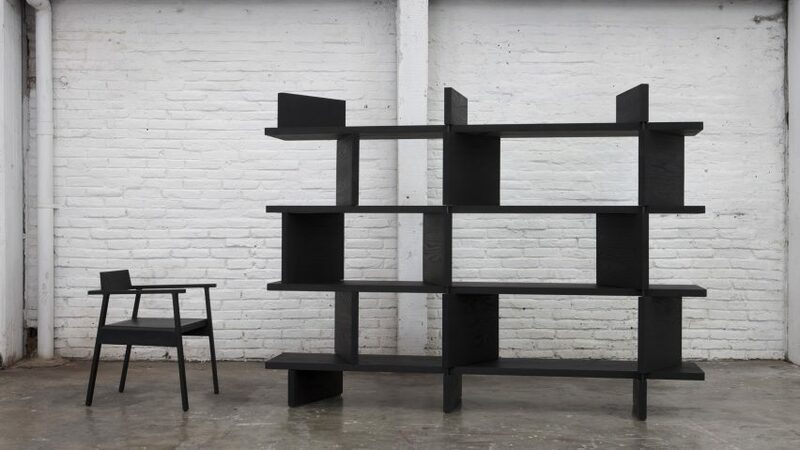 Esrawe Studio is launching a collection of simple, stained black furniture at its showroom during this year's Design Week Mexico in the country's capital. Esrawe Studio's Intervalo exhibition features four new pieces – including a bookshelf, two chairs and a dining table – all of which are assembled from solid red oak wood, stained black. To achieve this look, the Mexico City-based studio sanded the material and then applied a black pigment to tint it. Lastly, black oil was added to seal in the colouring. Thick slices of wood form the shelves of the Cartela bookshelf in the series, with shorter sections placed to form the vertical separators. Steel bars thread through the supports to both secure them and allow them to rotate in different directions. "The location of the vertical axes of the piece, as well as the position of its palettes, dictates the possible configurations of the set, and allows great versatility in terms of language and expression of the design," said Esrawe Studio in a project description. "The shapes and the finishes used reinforce a proposal free of ornaments, to emphasise the absence of visual noise and sculptural character of the piece." Because of its modular design, Cartela can be built in two heights: a 177-centimetre bookshelf and an 88-centimetre credenza. The Kanji dining table is similarly designed to be arranged in two different layouts. The first sees a wooden bar placed underneath the long table top, with three legs splaying out at either end. The other layout flips the base upside down, so that the supporting bar runs along the floor and the legs are angled to meet the top. "The form responds specifically to the areas of no contact with the user, physically reflecting this 'absence' in its construction," said the studio. "The sober character structure can be used as configuration and expression in two positions that confer an idea of opposites, absence and/or presence of itself." Esrawe Studio fixed together a series of slender, curved wooden elements to form the back of the Tandem chair so that it appears to be made of one piece. The seat is covered in black leather to complement the wood. A piece of black leather is also pulled taught across the seat of the other chair in the collection. Its frame, meanwhile, is assembled from angular elements with a tapered chunk resting on top to form the back support. The simple design is intended as a contrast to "the traditional ornaments in the furniture" found in traditional Mexican residential estates known as haciendas, from which the chair ironically takes its name. Esrawe Studio, which is among Mexico's best-known design studios, created the pigmented wooden furniture as a continuation of its past experiments with techniques and materials. These include products formed from molten glass, and a pairing of walnut and marble. "These pieces are part of its continuity in the understanding and constant learning of new processes and developments," said the design studio. "This meticulous and great technical and artisanal skill process, it is a distinctive perspective in the philosophy of the brand." Esrawe Studio is hosting the Intervalo exhibition in its showroom at Alejandro Dumas 161, Polanco, to coincide with Design Week Mexico – which takes place from 10 to 14 October 2018. Other Mexican design studios launching products during the citywide event include Davidpompa, which is presenting its Meta lamp made of volcanic stone, and Bandido, which is debuting a table featuring a droplet-shaped marble base.